Two girls squabbling over social media success – if I wanted adolescent drama, I’d ask my 15-year-old niece about life at her high school. But mercifully, this story ends quickly. Harley has been brought down by Minor Disaster, daughter of Major Disaster (but what happens when she turns 21?) via social media. 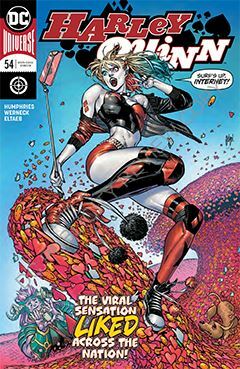 So Harley tries to rebuild her credibility by destroying that of her new foe. Yeah, that always works. Just ask any of the losers in last month’s U.S. elections. Thankfully, Harley is empathetic enough to see the schadenfreude through the trees. Minor Disaster, not so much. She seeks approval from her D-list super-villain father, who is a failure on all fronts. So why she needs his validation is beyond me. But former-psychoanalyst-turned-anti-hero Harleen Quinzell is able to use her medical degree for something other than hiding a stain on the wall. But is it too late? For Minor’s got a major catastrophe brewing which could spell doom for the very specific region of Coney Island. I’m sure it could be fun story, viewed through the proper lens. I just don’t happen to have one. There are too many story elements taken for granted, in my opinion. But in fairness, a broader canvas (i.e., more pages) might have enabled Sam Humphries to flesh them out more, perhaps provide a more ambitious alternative.